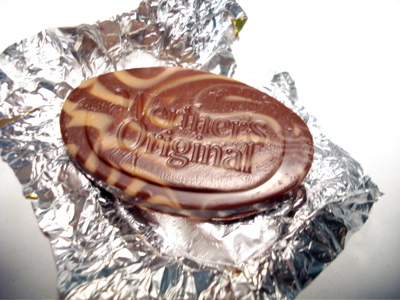 Hard butterscotch candies may be almost as ubiquitous as fruit-flavored hard candies, but thereâ€™s always been something different about Wertherâ€™s Originals. Perhaps itâ€™s their delicate balance of sweet and salt, or perhaps itâ€™s the fact that theyâ€™re made with real cream and butter, but in a candy market filled with generic butterscotch candies, thereâ€™s only one Wertherâ€™s. Until recently, that is. Like many other classic candies, Wertherâ€™s are now available in an array of different forms â€“ from caramel-coffee to sugar-free to caramel-mint, and now, these Wertherâ€™s Originals Caramel Chocolates. I was initially very curious about what â€œcaramel chocolatesâ€ would involve â€“ these seemed a little thin to have any kind of a liquid center, so my guess was that they contained crushed Wertherâ€™s hard candy bits. It turned out I couldnâ€™t have been more wrong. Instead, the oblong discs of chocolate are swirled with what appears to be caramel-flavored (and colored) white chocolate. Theyâ€™re actually quite striking, but how do they taste? When theyâ€™re unwrapped, they give off a scent of butterscotch ice cream topping, giving me a major craving for a McDonalds ice cream sundae. Flavor-wise, they’re a dead ringer for one of my favorite chocolate bars, the Caramilk, only with the caramel and chocolate swirled together. I donâ€™t know if they outsourced the chocolate to a larger manufacturer (a pretty common practice), but it definitely tastes like a Cadbury product, like a Creme Egg, with the flavor but not the overwhelming sweetness of a gooey sugary filling. I donâ€™t detect any flavor notes that scream â€œWertherâ€™s,â€ but these are definitely better than I was expecting, if only because they taste like my childhood. In all, I found these a pretty tasty item â€“ and pretty to boot. These are definitely something different for Wertherâ€™s, but as we all know, different can be a good thing. I like your suggestion of little werther’s bits in milk chocolate. That would be good! wait, are these hard candies or chewy? did you crunch them or just wait til they dissolved? Amy – None of the above! They’re 100% chocolate.